This In Focus asks whether Dancers on a Plane – a key painting from Johns’s ‘crosshatch’ period – can be seen as a work about the shifts and transitions taking place in the artist’s style and career in the early 1980s. 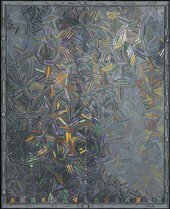 Executed using the hatching motif that was central to his painterly practice from around 1972 to 1982, Jasper Johns’s Dancers on a Plane 1980–1 consists of oil on canvas and an artist-made decorated bronze frame. The painting is one in a small suite of works of the same name made by Johns starting in 1979. This In Focus project situates Dancers on a Plane within the specific context of Johns’s career around 1980, as well as among his crosshatching paintings more broadly. It considers the Dancers on a Plane series as a whole and the place of the Tate picture within it. The project also examines the importance of the artist’s association with the dancer-choreographer Merce Cunningham, whose name is suggestively stencilled along the bottom edge of Dancers on a Plane, and explores the relevance to the work of Johns’s interest in Tantric art. Published in April 2017, the project is authored by Katherine Markoski (Washington College) with contributions by Seth McCormick (Western Carolina University).